Dingell and his wife, Congresswoman Debbie Dingell have been supporters of the Ford School. Congressman Dingell made many visits and gave many talks over the years, and Congresswoman Dingell currently serves on the Ford School Committee. 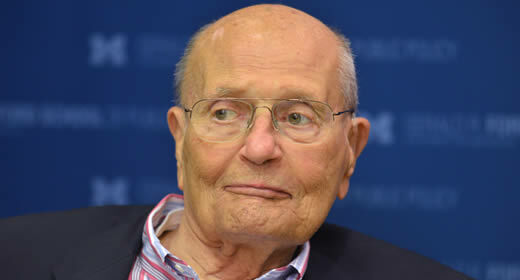 “It was my honor to host John Dingell at the Ford School many times while dean. I always enjoyed his quick wit, wise reflections, and insightful stories from his nearly six decades of distinguished service in Congress. Our students benefited greatly from his expertise and example over the years as he inspired them on their journeys to become public servants,” said Susan M. Collins, Edward M. Gramlich Collegiate Professor of Public Policy and former dean of the Ford School. Congressman Dingell was a close friend and colleague of the school’s namesake, Gerald Ford, and would often reflect on their friendship while giving talks at the school. During a conversation in February 2012 about the issues facing Congress, Dingell noted “I was able to work very closely with Jerry Ford, who was a personal friend and a really great president.” The two were known for their bipartisan efforts. “When it comes down to it, the best political leaders are those who put partisan labels and rhetoric aside to best get the job done," Dingell told State & Hill in a December 2013 story, praising Ford’s Congressional service. View photos, videos, and news items from Congressman Dingell’s visits to the Ford School over the years.